Winter wedding photos. Does anybody talk about them? I know that winter might not be the most popular time to get married. However, our experience over the last few years at Mango Studios might prove that winter weddings are actually becoming a thing! We have been blessed to photograph some of the most magical winter weddings out there, showing this time of year produces breathtaking images. Having said that, it feels like there is still some skepticism when it comes to winter wedding photos. As much as you love winter, it’s only natural that you might be worried about the weather and the cold. It’s not easy to look cute and happy in love when it’s -20C degrees outside and you’re shivering from the wind chills. However, I am still convinced if executed correctly, the cold weather and snow can add magic and character to your wedding photos. Just like when I encouraged you to snap photos with the best fall foliage, delicate spring cherry blooms or pose in the summer sunshine, I’m here to tell you that snowy wedding photos are pretty much the best! With snow in the forecast, let’s focus on the romance, coziness and soft white snowflakes that make your photos magical and unique. I thought it would be great to share some ideas and tips on how to make the most out of your winter wedding photos. 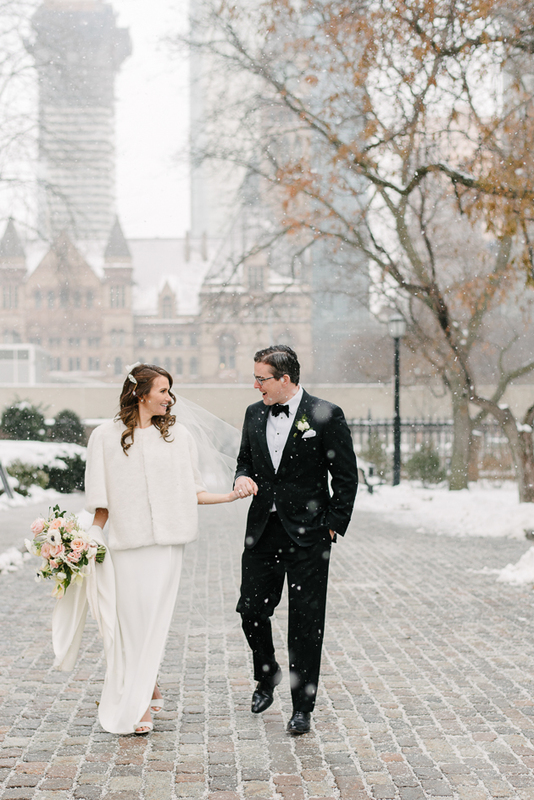 Think of all the creative possibilities that winter weddings bring. Whether you wake up on the big day to six feet of snow or see some flurries as you enter your venue, there’s a magical component to all those sparkling white flakes. When it comes to spectacular wedding photos, snow virtually guarantees an awe-inspiring natural backdrop. If it’s snowing, make sure to go outside as part of your photo session. Don’t fight the weather and let the season’s magic fill your photos with that extra touch of bliss. As always, think about locations and choosing the most picturesque spots your priority. If there’s a snow-covered park on your way from ceremony venue to the wedding reception, stop by to take some breathtaking images. Having an indoor plan is a good idea, but don’t be compelled to stick with only indoor photo options, as you only have one opportunity to take wintry photos. 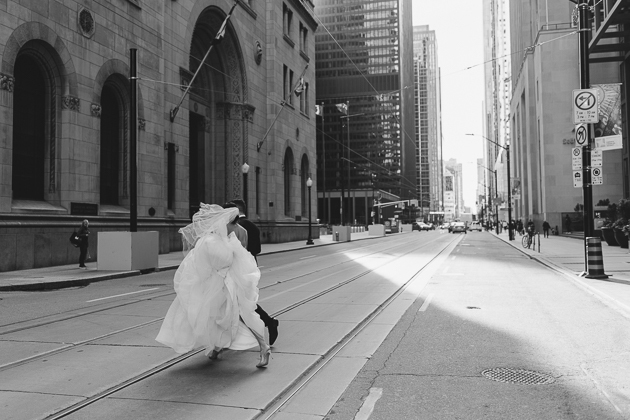 Feel free to pick your photographer’s brain on the best wedding photo locations in the city. They will surely have some great ideas! How about bringing a pair of cute winter boots to wear during your pictures? Your dress is likely to cover the boots and you will be able to walk from one location to another without ruining your shoes. Also, think about bringing some elegant jackets or faux fur wraps. When I see my winter brides wearing stylish wraps I’m in wedding photographer’s heaven! I not only love the look, I’m happy because my bride will be able to stay outside comfortably. While winter daylight lends itself to soft and magical light, the days are much shorter. I always recommend scheduling your winter wedding photos in the morning when there is plenty of beautiful glowing sunlight. Don’t worry about harsh light this time of year, as winter’s overcast clouds act as a giant softbox making it possible to shoot anywhere you want. Think About Your Gorgeous Winter Photos! I understand that a chilly wedding photo session isn’t everyone’s idea of a fun pre-wedding activity. But why pick a winter wedding date if you don’t want to take advantage of the unique attributes of the season? Your wedding is a once-in-a-lifetime event and you want to make it as memorable as you possibly can. When you’re feeling reluctant to go outside to snap a few shots, think about how gorgeous your wedding photos will look! With the snow-covered ground and the snowflakes floating in the air, you have a perfect chance to grab a few breathtaking images. While you might have a few uncomfortable or chilly minutes, they’re well worth it to capture all the beauty your wedding season has to offer.